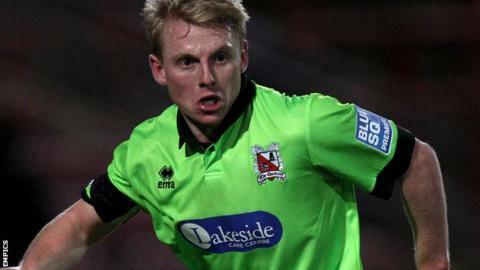 Midfielder Jamie Chandler's late goal saw Gateshead come from behind to beat Chester in the Conference. Craig Hobson put the visitors ahead when he reacted quickest to a mix-up in the Tynesiders' defence. The post denied Hobson a second before Jon Shaw converted a second-half penalty to level after being fouled at a corner by Danny Harrison. Chandler blasted home the winner from close range to give Gateshead a second home win of the season. Match ends, Gateshead 2, Chester FC 1. Second Half ends, Gateshead 2, Chester FC 1. Jamie Chandler (Gateshead) wins a free kick. Substitution, Gateshead. Craig Baxter replaces Alex Rodman. Hand ball by Lewis Guy (Gateshead). Attempt missed. Danny Harrison (Chester FC) right footed shot from outside the box misses to the left. Substitution, Chester FC. Chris Iwelumo replaces Kingsley James. JJ O'Donnell (Gateshead) wins a free kick. Goal! Gateshead 2, Chester FC 1. Jamie Chandler (Gateshead) right footed shot from the left side of the box to the top left corner. Assisted by Lewis Guy. Attempt missed. Jon Shaw (Gateshead) header from a difficult angle on the left is too high. Assisted by JJ O'Donnell. Substitution, Chester FC. Peter Winn replaces Craig Hobson because of an injury. Substitution, Gateshead. Lewis Guy replaces Daniel Wright. Hand ball by Sean McConville (Chester FC). Foul by Danny Harrison (Chester FC). Attempt blocked. Jon Shaw (Gateshead) right footed shot from outside the box is blocked. Goal! Gateshead 1, Chester FC 1. Jon Shaw (Gateshead) converts the penalty with a right footed shot to the bottom left corner. Penalty conceded by Danny Harrison (Chester FC) after a foul in the penalty area. Penalty Gateshead. Jon Shaw draws a foul in the penalty area. Attempt missed. Ben Clark (Gateshead) left footed shot from the right side of the box is too high. Substitution, Chester FC. Wayne Riley replaces John Rooney. Offside, Gateshead. Jamie Chandler tries a through ball, but Jamie Chandler is caught offside. Attempt missed. Rob Ramshaw (Gateshead) left footed shot from the left side of the box misses to the right. Attempt saved. Daniel Wright (Gateshead) right footed shot from the left side of the box is saved. Substitution, Gateshead. Rob Ramshaw replaces John Oster. Craig Hobson (Chester FC) hits the woodwork with a header from a difficult angle on the right. Assisted by Danny Taylor with a cross. Second Half begins Gateshead 0, Chester FC 1. First Half ends, Gateshead 0, Chester FC 1. Attempt missed. Alex Rodman (Gateshead) right footed shot from outside the box misses to the left.